1932 Series 50 - Just pulled engine - WOW! Hey all, I am in the middle of restoring a 1932 Buick 67 and the plates that are on it are CA 1947. I would love to have a pair of CA 1932 plates to go with it, and seeing how I don't need the '47 plates, I would like to make a trade or a deal with anyone who has '32 plates. Thanks! new internals in old straight 8? My father purchased this car from the original owner more than a decade ago and immediately began the meticulous restoration and rebuild. He passed away 2 years ago leaving her about 2/3 of the way finished. The same mechanic has numbered each part and all is ready for the final assembly. The body has been sanded and primed with fenders removed in order to begin the final exterior paint job. As advised by classic car aficionados, I'm leaving her in this condition to allow the new owner the pleasure of finishing out my father's dream. MUST SEE!!! ALL ORIGINAL PARTS!!! SECOND OWNER!!! Impeccable interior with the teakwood and mohair fabric (both original) to make this Interior the prized possession of this car. *Engine and its cover are complete lacking only routine maintenance to make it run *Covered when not being worked on and always in a garage with minor exposure to the elements *Maintenance records available After taking care of the odds and ends of my father's estate, I've finally been able to take this on. The asking price is $15k but if any experts feel this isn't appropriate for it, please advise and I will give many thanks and much appreciation for the help. I've been getting a lot of referrals and had very little feedback. CAN ANYONE GUESS WHAT TYPE OF HUPMOBILE THIS IS, IT HAS NO SUICIDE DOORS, BUT HAS LOEWY WHEELS?? 3 WINDOW COUPE WITH RUMBLE SEAT, BARN FIND IN CHANNING TEXAS. I DONT KNOW WHAT YEAR IF ITS REALLY A 1932 -33 B216 OR I226?? 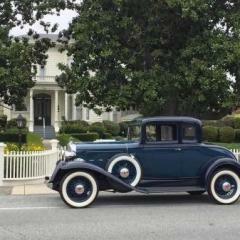 I have a 1932 Model 57 4-door sedan for sale. Body is in excellent condition - super wood, all steel fine and primered ready for paint. Engine and chassis also good - wood artillery wheels, good original honeycomb radiator. All parts believed present except upholstery and wires. No title, but chassis number is visible, will provide Bill of Sale for registration. First $3,000 takes it. For sale locally, too. Pictures on request (after Friday, November8 - when i next get a chance in daylight). Located near Albany, NY. Can deliver within reasonable (there and back one day) range. I have a 1932 hupmobile cabrolet body shell. I am in need of a lot of the missing parts. I would like to restore it. Phone 320-251-4228, email mk@kiliantruckline.com Thank You. -Mike Maybe a rough sedan or coupe as a doner ? I am in need of a crank hole cover for my 1932 Dodge DL Coupe. If anyone knows of one for sale, please send me a private message, or reply to this thread. I missed one a while ago on eBay, mostly because I wasn't sure if it was correct or not. Anyways, if someone out there has one, I would be interested in purchasing. (actually, I would be interested in two, as both coupes I am restoring are missing this cover, but I doubt that someone has two spare covers!). Thanks! I am putting in new kingpins and bushings on my 1932 Pontiac. Does anybody have any tips on accomplishing this job. Since I don't have any of the special tools shown in the repair manual I have to improvise. Anybody have any experience and tips? What do you use to ream the bushing out and fit the kingpin? Happy for any help you can give.